Instagram is one of the most popular social media platforms that millions of people are using. To become popular on this platform and creating a profile that will stand out can be quite difficult. So, if you want to grow your Instagram account, you will certainly need an app to help you get your Instagram on the next level. But, how to find the best app? What will that app offer your Instagram and will you get the popularity fast? We discovered one great app for Instagram purposes – Rocketing for Instagram. Let’s discuss about the app. 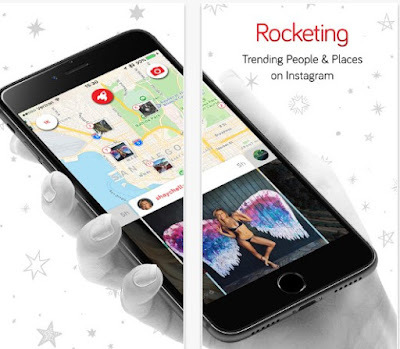 Rocketing for Instagram is an awesome lifestyle app, suitable for IOS users. The app can help users to get their Instagram popularity higher and make their Instagram experience more interesting. The users can follow the latest trending places, people, and parties worldwide. The app can follow many interesting and popular people, and get followers using this app, allowing them to get on top of leaderboards locally and to win access to important parties and get different prices for their achievements on Instagram. This app is highly helpful and efficient tool for IOS users that want to get their Instagram profile on the next level. The app gives the users trends within seconds, with every logging on Instagram the users can get the lasts geo-tagged photos and videos in a few seconds. The users can share photos and get Rocket Fuel from the app with every like on their photo. After 24 hours the fuel burns out, letting the users see only the most relevant posts in the moment. The users can follow popular people and get followers directly from the app, getting on top of local leaderboards and winning prices or access to parties.